Gen Con, the largest and longest-running hobby gaming convention in North America, celebrated its 50th anniversary in Indianapolis August 17-20. For the first time, 4-day badges sold out, and attendance was the highest it’s ever been. This year, the convention expanded to the field level of Lucas Oil Stadium, home of the NFL’s Indianapolis Colts, in addition to its space in the Indiana Convention Center and participating hotels. For the first time, Gen Con also hosted a concert in Bankers Life Fieldhouse with a performance by Grammy-winning recording artists They Might Be Giants. It was certainly an historic event! My favorite part of Gen Con is always, of course, getting to demo ALL THE BOARD GAMES. Below are brief descriptions of my favorites from the con and links to more information from BoardGameGeek (a must-visit website for tabletop gamers). The games are in no particular order. Being a bookstore owner and a general bibliophile, I was SUPER excited about this game, even before Gen Con. 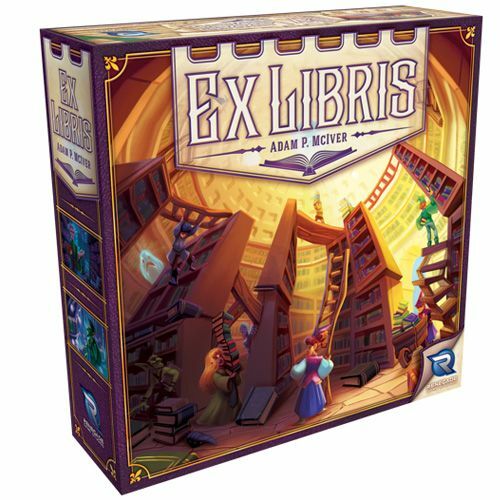 In Ex Libris, a worker placement/set collection strategy game, you act as a collector of rare and valuable books. The Mayor and Village Council have announced an opening for Grand Librarian, and you’re vying for the title against other local book collectors. To impress the powers-that-be and win the Grand Librarian-ship, you have to build an amazing personal library, making sure to collect the most impressive tomes, alphabetize them accordingly, make sure your shelves are stable enough to hold them, and collect books in a variety of different subjects. Renegade Game Studios is one of the best at theming, and this game absolutely nails the theme. Make sure to actually read the titles of the books you’re placing on your shelves! I’m really excited to own this game, and if you love books as much as I do, you will definitely want to own it as well! BEEEEES! was one of the pleasant surprises from Gen Con. I hadn’t heard of this game before attending, and I found it while wandering around the exhibition hall. I was impressed with the theming and mechanics, considering it’s such a small, short game. BEEEEES! 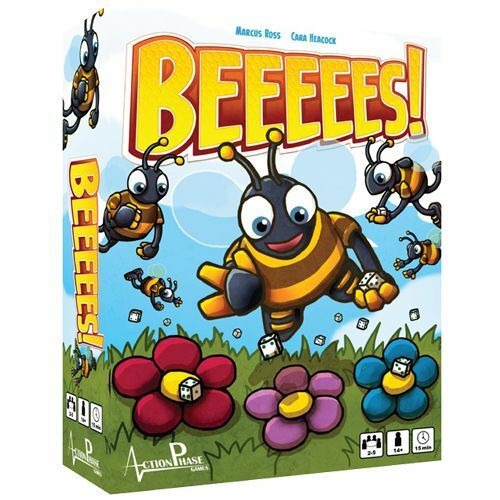 is a real-time dice rolling/tile placement game where players frantically roll dice to claim hive tiles to build their hives and impress the High Queen bee enough to become her heir. You’ll need brains as much as speed in this game to be sure to build your hive in a way that will give you the most points at the end of the game. Pay no attention to the cereal box-style art on the box of this game — it’s way better than it looks. This was another Gen Con surprise game. I knew about this one going in, but I wasn’t much interested in it based on the silly box artwork and the descriptions I had read of it. But, we were at the IELLO booth anyway, so we figured why not try it out? I’m glad I did! 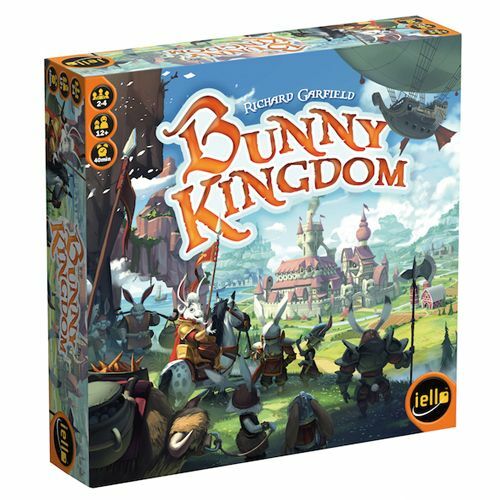 Bunny Kingdom is a territory building/card drafting game in which players draft cards 7 Wonders style, passing them around the table, to build cities and control resources. The game is played in four rounds of card drafting, constructing, and scoring. There are also parchments you can collect during the game for end-game scoring. At the end of the fourth round, whoever has built the best bunny fiefdom and has the most victory points wins. This game was surprisingly fun despite the silly bunny theme, and it is a light game that is a great alternative for people who like strategy games, but don’t want to spend 2-4 hours playing. 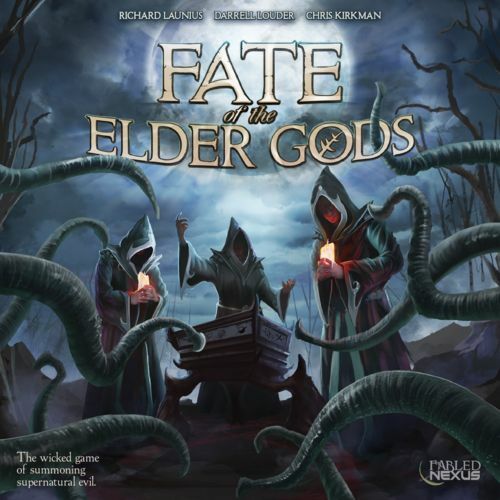 Fate of the Elder Gods: 1-4 Players / 30-90 Minute Play Time / MSRP: $80 / Get at game stores now! I wrote about this game after last year’s Gen Con, when I got to see a very early demo of it. It was released at this year’s convention, so I finally got to play a full game. In this dice rolling/worker placement/hand management/area control game, players take on the role of competing cults trying to summon ancient evil gods and herald the fall of mankind. The goal is to summon the god you worship before the other players — and to repel the pesky investigators who keep coming around to try to seal your gates. There is quite a lot to remember the first couple of times you play this game, but there are player cards to help, and it’s easy to get the hang of it. Once you do, you’ll definitely want to play again! The theming is spot on (Greater Than Games is also one of the best at theming), and the game is very well made, including cool miniatures. There’s a bit of a “take that” mechanic in this game where you can mess up other cults that’s fun, and there are variable player powers from the different gods that give the game good replay value. This game is definitely worth checking out! I’m a big fan of both Flick ’em Up! and Dead of Winter, so I was very interested to see how this mashup would work. Flick ’em Up! 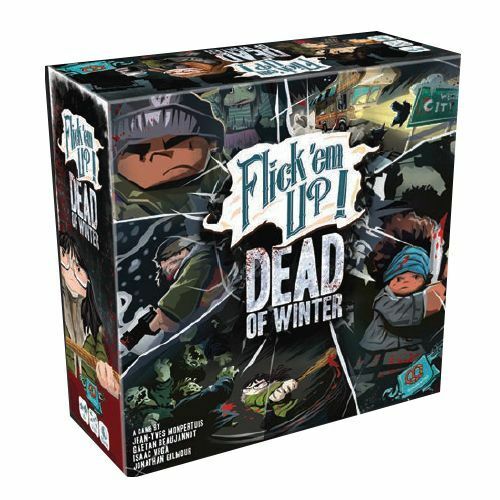 : Dead of Winter pits players against zombies in a dexterity game that has you using tools in various ways to take out the undead while they shamble randomly in your direction. The locations are the same as in Dead of Winter, and the game uses crossroads cards and similar characters to Dead of Winter. You have guns, as you do in Flick ’em Up!, but you’re also given a bat and a knife, which are silent weapons, because as anyone who has played Dead of Winter knows, zombies hate noise. There is a new mechanism of the “zombie tower,” which puts zombies out at the end of each phase of the game. This game delivers quite exactly what it advertises – the perfect mashup of Flick ’em Up! and Dead of Winter. This is one of the games I’m most excited about. You can view a video walkthrough of the game here to see how it works. This was another surprise game that I discovered while walking the exhibition hall. I saw them demoing it at Matagot’s booth, and I just had to stop and play. 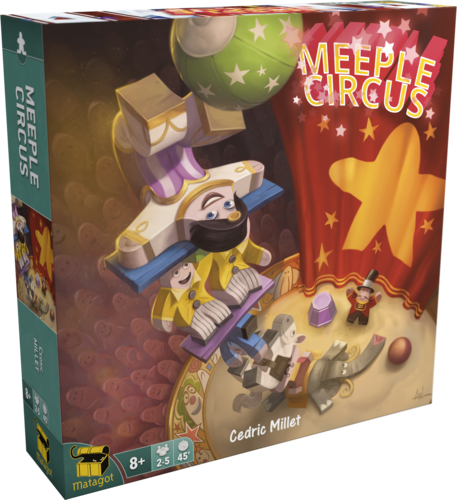 Meeple Circus is a dexterity, meeple-stacking game where you only have one goal: entertain the audience. The game is played over three rounds, each round adding additional types of circus performers to your show. You build your engine by drafting cards, then once you have everything you need, a timer starts, and you have one minute to stack your meeples to build an amazing performance. The timer is no ordinary timer — it’s in the form of one minute of circus music, which makes it really intense while you’re stacking meeples. We laughed so hard while playing this game, and the meeples are amazing — everything from camels and elephants to Tarzan and a strong man. This game NAILED the theming better than any game I saw at Gen Con, and it was really fun to play. Out of everything I saw, this is the game I’m most excited about. I heard about Shark Island on The Dice Tower’s Gen Con preview podcast, and it intrigued me. 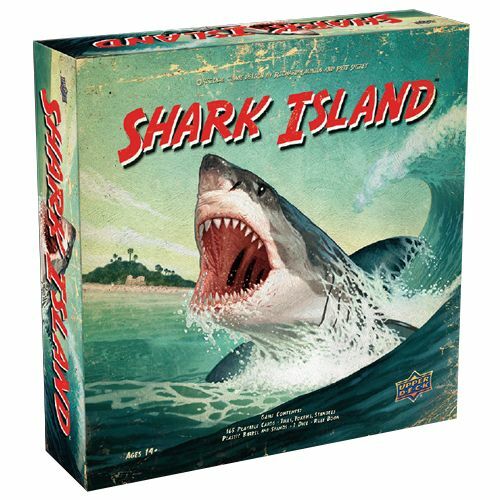 This is a one-versus-many semi-cooperative game that pits up to four shark hunters against a monstrous great white shark (controlled by another player) that is terrorizing the island. Hunters must work together to first locate the shark (while the shark uses hidden movement to try to avoid the hunters). Once the shark is found, hunters engage in rapid combat to either kill the shark or force it back out to sea. If the hunters kill the shark, they win. The shark, on the other hand, wants to outsmart the hunters and accumulate enough terror to win the game by achieving the terror goal they choose at the beginning of the game. The hunters and the shark also have special abilities that can influence the outcome of the game. If you’re a Jaws fan or a fan of shark week, you’ll definitely want to pick this one up! There are a lot of H.P. Lovecraft-themed games out there, but none quite like this one. 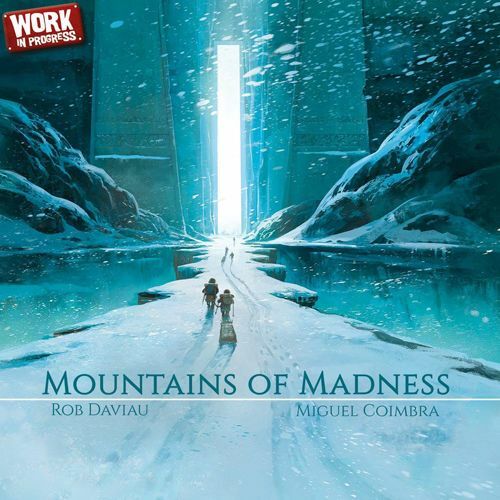 Mountains of Madness is a cooperative game where players are a team on a scientific expedition that discovers a new and intriguing mountain range in the middle of the Antartic polar circle. The expedition must climb to the top of the mountain and escape, but along the way, your mental health will be put to the test. Your team turns over tiles to try to collect relics while climbing the mountain, and throughout the game, team members collect various forms of madness that will impair their ability to communicate — from not being able to speak at all to being forced to speak in a weird accent. The madness is what really makes this game fun, as it gets wild and frantic during the short time you have to actually cooperate. It’s a tough game to win, but a great game to play! 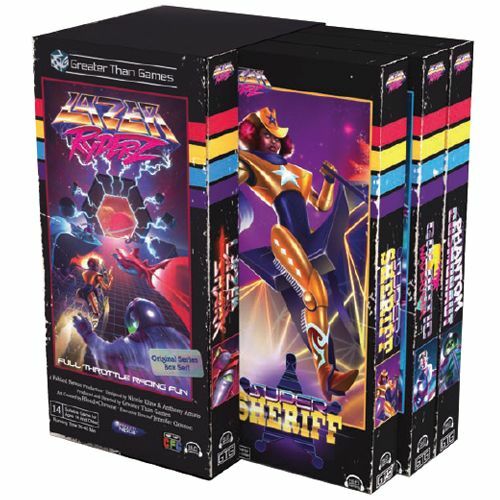 As evidenced by the amazing retro packaging of this game, Lazer Ryderz is a 1980s dream. The designer, Anthony Amato, whom I met at the con, is a huge Tron fan, and he wanted to make a game with that theme. Lazer Ryderz delivers it perfectly. In this game, you race other players to collect three prisms by constructing lazer paths with various pre-formed pieces that you place according to how fast you’re going and the direction in which you want to go. There are light push your luck, area denial, and strategy elements to the game, and the packaging is AH.MAZ.ING. This game is quick and fun, and it will look great on your shelf. I had the pleasure of meeting Jamey Stegmaier, the designer of this game and head of Stonemaier Games, at the con, and I was able to get a sneak peek at this game. Stonemaier Games makes my absolute favorite game, Viticulture, and is definitely in the top five when it comes to theming. Charterstone is a competitive legacy worker placement game where you construct buildings and populate a shared village. When you construct a building, a sticker is added to the board, and that becomes an action space for any player to use. Thus, at the beginning, you’ll have simple choices and few workers, but as the game moves along, you’ll end up with a bustling village with dozens of possible actions. 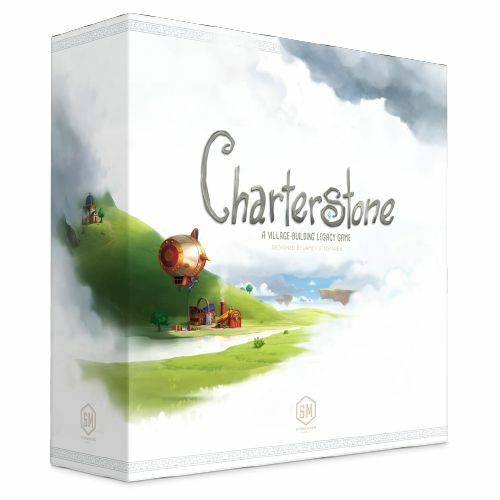 You’ll get through the entire Charterstone journey in 12 games; however, what’s really cool about this game is that you can continue to play it even after your campaign is over, as the completed village will create a one-of-a-kind worker placement game. There is also a “Recharge Pack” you’ll be able to order that will contain everything you need for a second campaign, so you can flip over your game board and start again! I didn’t get to see much of this game, as I didn’t want to ruin the campaign for myself, but I’m SUPER excited to play it!